F I N A L L Y ! I hear you cry. At last, we have been blessed with beautiful country inspired watches for both Men & Women. 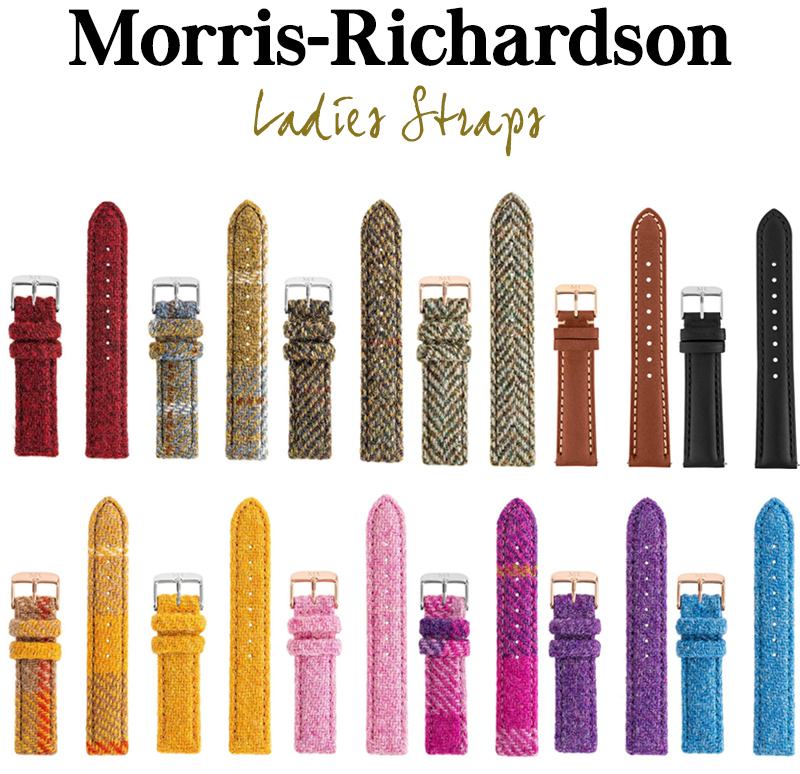 The luxury brand, Morris-Richardson have released their gorgeous designs and an array of stunning tweed straps to match almost every outfit. I've been lucky enough to try them out with lots of different outfits and I can confirm, they are worth the hype. I love them! The different straps are fantastic and the range of tweed are brilliant, you can match them with your outfit; day or night, dressy or casual. The genuine Harris Tweed straps are wonderful and completely interchangeable too, which is amazing. It means you can give your watch a completely different look, just by changing the strap. Genius. 15% OFF just for you! I have displayed all of the Ladies straps for you so you can see the full range of amazing tweed! The deep red Belton strap is perrrrfect for Autumn/Winter. I'm so in love with this colour. I think this is my favourite of all. I'm really fond of the warm tones on this harris tweed strap. A sophisticated strap with a subtle hint of blue. Traditional and typically British this strap is great for those who prefer the understated classic country look. 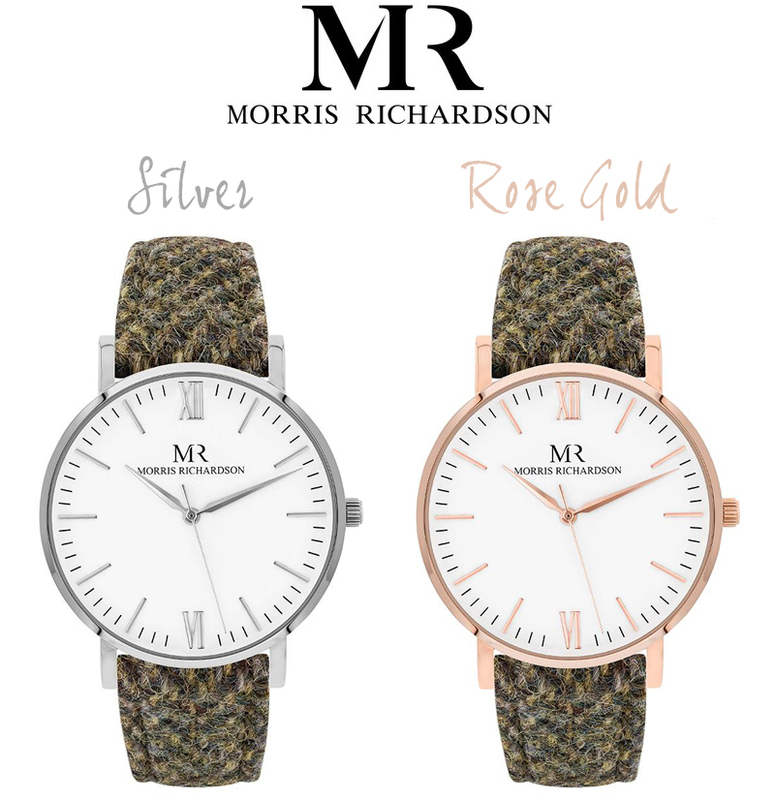 "Combining classic and minimalistic design with interchangeable quick release straps, each Morris Richardson timepiece is designed to seamlessly complement your style and provide the ideal companion for every occasion." "Whether it be a summers day at the races, a relaxing day on the beach or a formal black-tie event, our founder Tom Morris-Richardson could never find a single, high quality, fashionable watch that was designed to be the ideal companion for every occasion. It was this realisation that ultimately sparked the idea of creating Morris Richardson as a lifestyle watch brand. 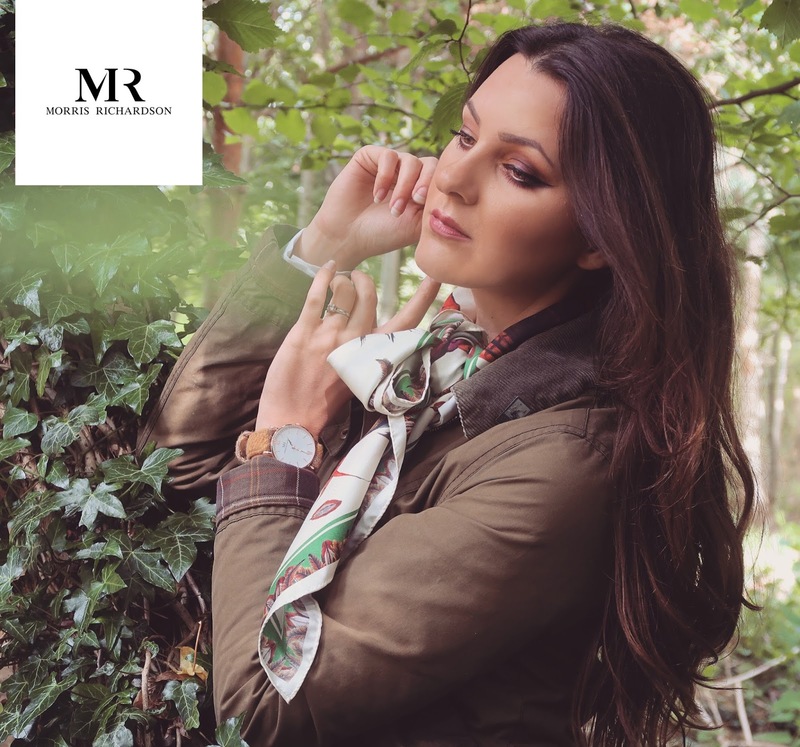 Eager to find a solution and with a true passion for quintessential British style he set out on an exciting journey to create a fashionable range of British inspired watches, timeless and elegant in design and importantly perfect for all occasions." "Tweed is so easy to wear and certainly not old-fashioned"
Exceptional quality is guaranteed with the Chatsworth combining a Swiss quartz movement, scratch-resistant sapphire crystal glass and a 316L marine grade stainless steel case. The watch design itself is clean, simple and really elegant. The rose gold and silver watch bodies are both classy and fashionable. The face is a great size. It's not too big for delicate wrists. I like the fact the design is not fussy; the logo is simple and discreet. The 3D hands also add an elegant finishing touch to the watch. I think the watch speaks volumes from the straps alone and you can really reflect your personality from your strap choice. The watches look stylish and are certainly eye-catching. They are so different to all other watches out there and I have never seen anything like them before. 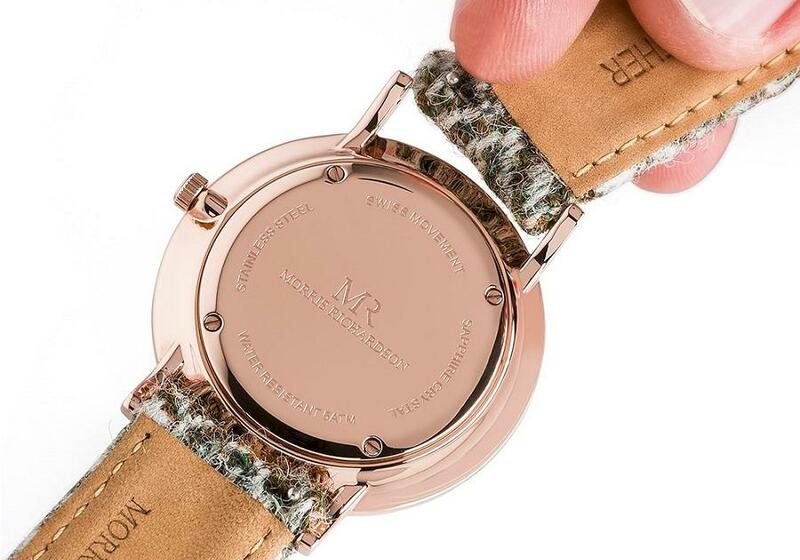 The affordable watch straps are brilliantly priced too (£39/£45) which I'm really pleased about. A great little pick me up treat for yourself and would make a great present too. I don't think you could ever get bored of this watch! The watch body is a great investment piece as the strap will always be interchangeable. The tweed straps look amazing with country outfits. I like to try and match my straps with the tweed I am wearing but some times a bit of contrast is a good thing! Tweed is so easy to wear and certainly not old-fashioned. I love mixing tweed with, whats considered more 'fashion' clothing. I like to mix eclectic with modern, there is something really unique about it. Add a hint of tweed to your outfit with one of Morris-Richardson' tweed straps. Changing the strap is simple. It takes a few attempts first time round but as soon as you get the hang of it, it's super easy. You can dress this watch up or down, it looks sophisticated and classy in any circumstance. It would look great tucked away under a big tweed field coat but also great for work days and evenings sat in the pub by the fire. "The ideal companion for the modern, fashionable and style-conscious lady." I'd love to know your thoughts! What's your favourite strap? 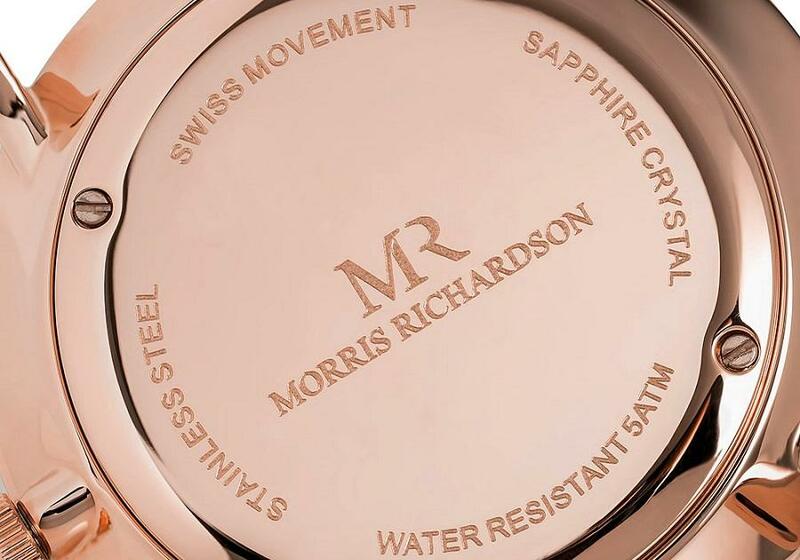 I partnered up with Morris-Richardson Watches for this post. I only ever work with brands I love. All opinions are my own and I will always be honest and truthful. Design, photography, wording. opinions and quotes (in gold and black) by self.